What: Media are invited to attend the ground-breaking ceremony for the Joint Manufacturing and Assembly Facility (JMAF). 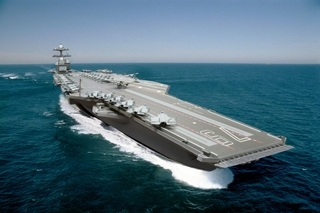 The JMAF will support Newport News Shipbuilding's Gerald R. Ford-class aircraft carrier construction and current and future submarine construction. Who: Speakers will include Newport News Vice Mayor Robert S. Coleman, Newport News Shipbuilding President Matt Mulherin and Newport News Shipbuilding Vice President of Trades Operations Ray Bagley. Where: Media will park in a designated area north of Newport News Shipbuilding's North Yard parking lot (see directions below). Flat, comfortable shoes are recommended. The JMAF is designed to include multiple worksites, advanced technology, automated equipment, heavyweight cranes, large transportation doors and specialty paint bays to enable more efficient construction processes. Opening in 2017, the initial phases of the facility will include production bays to improve construction efficiencies under current contracts for the Gerald R. Ford-class aircraft carrier and Virginia-class submarine programs.